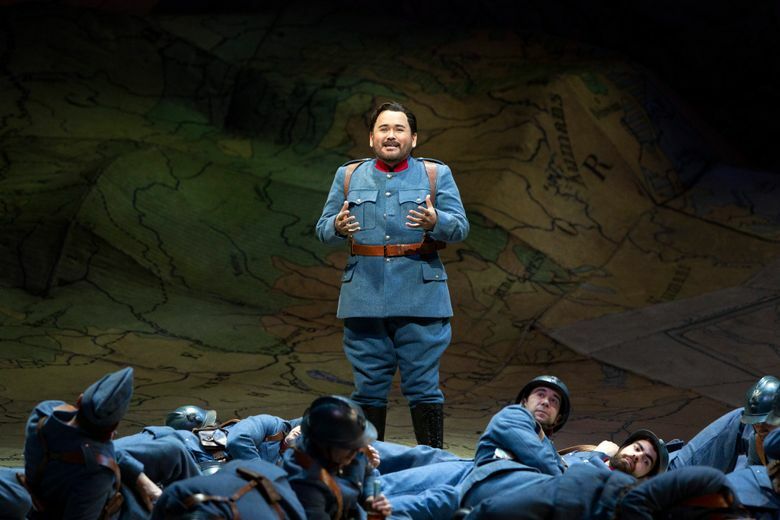 NEW YORK (AP) — When Javier Camarena explodes with joy singing nine high C’s in Donizetti’s “La Fille du Regiment (Daughter of the Regiment),” there’s a good chance the Metropolitan Opera audience will explode right back at him with demands for an encore. Bowing to that will would be nothing new for Camarena, who has encored arias in two operas at the Met — Rossini’s “La Cenerentola” in 2014 and Donizetti’s “Don Pasquale” two years later. In “La Fille” — its English title is “The Daughter of the Regiment” — Camarena plays Tonio, a peasant whose love for the title character leads him to enlist in the army. When the soldiers consent to their marriage, Tonio erupts in a bravura display that requires him to leap up repeatedly a full octave to high C, a note that always excites an audience when hit at full throttle. Camarena will be singing his first Tonio at the Met in Laurent Pelly’s production, which also stars South African soprano Pretty Yende. It opens Thursday and runs for seven performances, the last of which on March 2 will be broadcast live in HD to movie theaters worldwide. He said Tonio is “very dear to me” because it was the role of his professional debut in Mexico City in 2004. The aria with those high notes, “Ah! mes amis,” comes easily now, but mastering it was a challenge. The first two C’s, coming on the syllables “MA” and “NA,’ were no problem. “You only open your mouth, pull the jaw down and the sound is already there,” he said. As unassuming and charming in person as he is onstage, Camarena happily demonstrated for a reporter what he sounded like when he first tried that second pair of C’s. Instead of coming out cleanly, they were slightly off-center and wobbly. Although nowadays tenors are expected to treat the audience to nine high C’s, Camarena displayed a copy of Donizetti’s 1840 score that shows only eight. The ninth, coming at the end, was “invented by some crazy tenor,” he said, and has become a traditional interpolation. Remarkably, it wasn’t until Luciano Pavarotti triumphed as Tonio in 1972 that “Ah! Mes amis” became a showpiece for tenors at the Met. Before that, the opera was seen as a vehicle for sopranos, and the aria was sometimes cut altogether. Camarena, his wife and children make their home in Zurich, Switzerland, where he joined the ensemble of the opera company in 2007. Now, at age 42, his voice is growing a bit weightier, opening up the possibility of a repertory beyond bel canto and Mozart. “The high part of my voice has been the most secure part of what I do … the center, the trunk, needed to be more secure,” Camarena said.